In addition to our regular Interest Groups we run a number of Short Course. These courses are listed in the group list with the suffix (SC). Short Courses differ from Interest Group in that they run for a fixed number of sessions. They can last anything from one day to a year and can be repeated on demand. If you would like to join any of these courses contact the leader. All previously run courses can be repeated if there is sufficient interest. Description: This course follows a FutureLearn programme sponsored by the University of Reading. It charts the progress of a month long dig in the Vale of Pewsey, a relatively untouched site compared to nearby Stonehenge and Avebury. Description: Learn how maritime archaeology investigates our changing relationship with the oceans and seas, from 2.5m years ago until today. This course will follow a FutureLearn programme sponsored by the University of Southampton. Description: This is a Short Course which will run in May and November 2019 over 4 weekly sessions. By which time each member should be able to work on his/her own and not need any more tuition. Pens and paper provided but you would find a clip-board and a folder for your work useful additions. Description: This course aims to move from no or little exercise to being able to jog for 30 minutes or 5k in just 10 weeks. The sessions build each week starting slowly and always at the pace of the individual member. The course remains within the confines of a football club and so is very safe. The aim of the group is to improve fitness and have fun doing it! Description Ever wondered why we react the way we do? We are wired to connect. Come and find how and why at this afternoon short course. 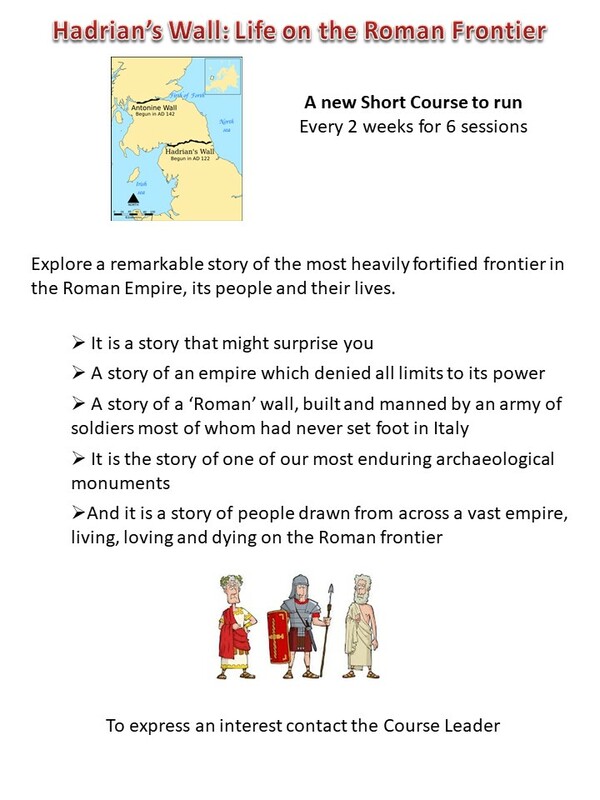 Description: Explore the archaeology of the most heavily fortified frontier in the Roman Empire, its people and their lives. It is a story that might surprise you. The story of our most enduring archaeological monument. 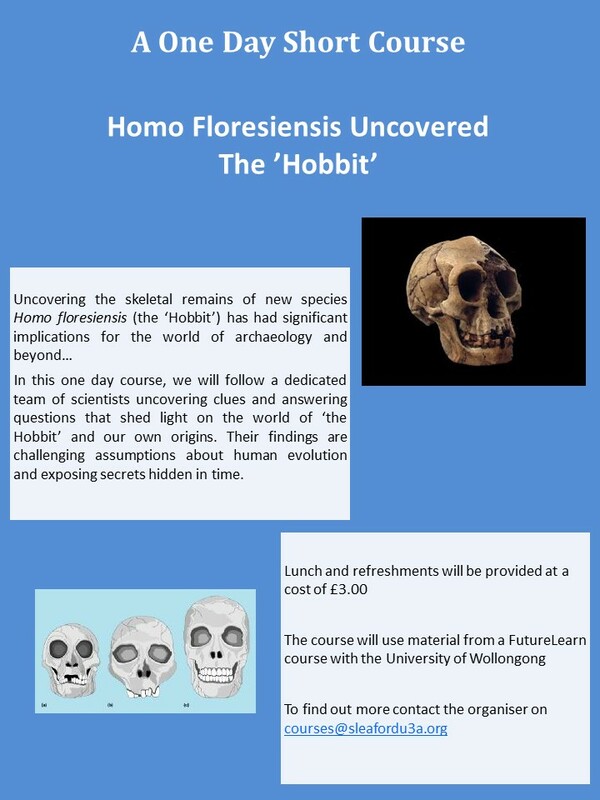 Description: In this one day course, we will follow a dedicated team of scientists uncovering clues and answering questions about the newly discovered species Homo foresiecsis (the Hobbit). See how their findings are challenging assumptions about human evolution and exposing secrets hidden in time.